The Brooklyn Navy Yard's Building 1 was formerly a barracks, complete with movie theater, laundry and rifle range. It has been empty for years, with paint peeling off the walls and broken windows throughout. Building 1 is now being leased to Steiner Studios, and is an important part of their larger expansion at the Navy Yard. Recent articles at Curbed, Brownstoner and the New York Post discuss this planned expansion in detail. In the meantime, Building 1 will soon be completely renovated by Steiner Studios. This is a last look at its original interior. 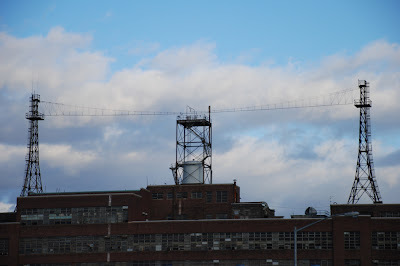 For more photoessays from the Brooklyn Navy Yard, click here. The Freedom Tunnel - "Covered Tracks"